Coffeehouses have replaced many of the old Orange Julius stands, but there's still a nostalgic group of us who long for the frothy juice drinks invented decades ago by Julius Freed. Today Orange Julius has tailored its business to meet the changing demands of its customers by including several varieties of fruit drinks and updated smoothies on its menu. 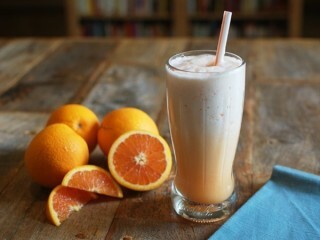 But it's the foamy fruit juice creation developed in the late twenties that made the company famous, and that's what I've cloned here in this Orange Julius copycat recipe, an improved version that's found in the book Top Secret Recipes: Sodas, Smoothies, Spirits, & Shakes. The flavor and consistency is better now, plus we use the blender to dissolve the sugar before adding the ice. Use pasteurized egg whites found packaged in your local supermarket or just use egg substitute, which is also made from pasteurized egg whites. Combine all of the ingredients except ice in a blender and blend on high speed for 15 to 30 seconds or until the sugar is dissolved. Add the ice and blend for another 10 to 15 seconds or so, until the ice is mostly crushed yet still a bit coarse. I worked for Orange Julius before they started using any Pre Mixes. First you had FRESH SQUEEZED ORANGE JUICE we left the PULP IN we used whole Eggs not just the whites, we used a fine sugar like Castor sugar not powdered or granulated (You can make Castor by Blitzing Granulated Sugar in a Food Processor or Blender for about 5 or 6 30 second pulses) We used Pure Vanilla Extract Paste and milk full fat not water. 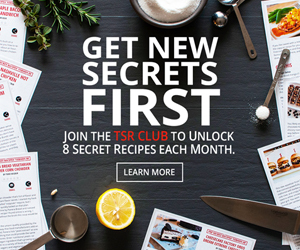 For some reason this site will not let me give this recipe less than 5 stars. As someone who managed an Orange Julius for many years I can tell you this recipe is not even close. Our ingredients came in two separate bags, each assembled in different factories. No one knew exactly what was in the entire recipe. But I will tell you there were far more flavors than just vanilla and the sweetener and thickener was absolutely not powdered sugar, which I have tried and was disgustingly sweet. This recipe is not what we made. It is not close to what we made.